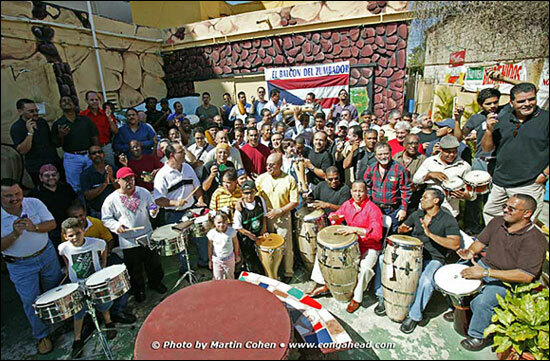 Puerto Rico is home to a thriving and exciting music scene, and in February 2004, I had the pleasure of visiting several locations there to document some of these musical happenings. Little Johnny Rivero organized a group photo shoot to showcase the Island's support of LP® products. It took place at a club called El Balcón del Zumbador in Santurce. Close to 100 talented musicians participated, including singing legends Cheo Feliciano and Adalberto Santiago. Immediately following the photo shoot there was a rumba. Two days later at the same location, I attended a performance of Cachete Maldonado Y Los Majaderos. Little Johnny Rivero was the featured guest at this event. The tradition of these photo sessions began in the mid 1980's with a gathering in Hollywood; the second occurred in 1989 to celebrate Tito Puente's 65th birthday. Nearly fifteen years later, on September 24, 2002, I returned to the same South Bronx Park to record yet another gathering of some of the most significant Latin musicians. The universal appeal of my company's products was further underscored in January of 2002, when I traveled to Shah Alam, Malaysia. Here, I assembled a group of Malaysian percussionists who were participating in a percussion jam. On February 21, 2004, a 50th anniversary concert for La Sonora Ponceña was held at the Rubén Rodriguez Coliseum. La Sonora Ponceña is one of the country's most venerated orchestras. Little Johnny Rivero, who worked with the band for 17 years, was an invited guest to this event. The photographs of all these sessions exemplify the camaraderie so many professional percussionists throughout the world feel toward LP®. To see 'Behind the Scene' PHOTOS from this event, please CLICK HERE. *All photos in this section provided by Ricard Ortiz.